Retinal degeneration is a retinopathy which consists in the deterioration of the retina caused by the progressive death of its cells. There are several reasons for retinal degeneration, including artery or vein occlusion, diabetic retinopathy, R.L.F./R.O.P. (retrolental fibroplasia/ retinopathy of prematurity), or disease (usually hereditary). These may present in many different ways such as impaired vision, night blindness, retinal detachment, light sensitivity, tunnel vision, and loss of peripheral vision to total loss of vision. Of the retinal degenerative diseases retinitis pigmentosa (RP) is a very important example. Inherited retinal degenerative disorders in humans exhibit genetic and phenotypic heterogeneity in their underlying causes and clinical outcomes. [a] These retinopathies affect approximately one in 2000 individuals worldwide. A wide variety of causes have been attributed to retinal degeneration, such as disruption of genes that are involved in phototransduction, biosynthesis and folding of the rhodopsin molecule, and the structural support of the retina. Mutations in the rhodopsin gene account for 25% to 30% (30% to 40% according to) of all cases of autosomal dominant retinitis pigmentosa (adRP) in North America. There are many mechanisms of retinal degeneration attributed to rhodopsin mutations or mutations that involve or affect the function of rhodopsin. One mechanism of retinal degeneration is rhodopsin overexpression. Another mechanism, whereby a mutation caused a truncated rhodopsin, was found to affect rod function and increased the rate of photoreceptor degeneration. Photoreceptor cell death is the eventual outcome of retinal degeneration. Without proper function of the photoreceptor cells, vision is not possible. Irreversible loss of these cells has been attributed as a cause of blindness in many retinal degenerative disorders, including RP. The exact mechanism of photoreceptor cell death is not clearly understood. Among potential causes is the endocytosis of stable complexes formed between rhodopsin and its regulatory protein arrestin in certain mutants. Various studies have also documented that over-expression of rhodopsin itself (mutations in genes involved in the termination of rhodopsin signaling activity have been shown to cause degeneration by persistent activation of the phototransduction cascade ) causes photoreceptor cell death and may induce photoreceptor cell loss in transgenic animals expressing truncated rhodopsin. Yet another mechanism may be prolonged photoreceptor responses and also abnormal rhodopsin deactivation may induce outer segment shortening and eventual photoreceptor death. In RP photoreceptor cell death is believed to occur by programmed cell death or apoptosis. Photograph of the United States Supreme Court Building, modified to illustrate the effect of visual field loss, tunnel vision, in patients with Retinitis Pigmentosa. Retinitis pigmentosa is a progressive neurodegenerative disorder, which affects 1 in 3,000 individuals and affects between 50000 and 100000 people in the United States. Autosomal dominant RP accounts for approximately 15% of these cases. Autosomal dominant retinitis pigmentosa (ADRP) is a genetically heterogeneous group of inherited retinal degenerations that cause blindness in humans. RP begins with death of rod photoreceptor cells, which are the only cells in the retina to express rhodopsin and which express it as their most abundant protein. Eventually, loss of rod cells leads to loss of cone cells (cone photoreceptors), the mainstay of human vision. Symptoms of RP include loss of sensitivity to dim light, abnormal visual function, and characteristic bone spicule deposits of pigment in the retina. Affected individuals progressively lose visual field and visual acuity, and photoreceptor cell death can ultimately lead to blindness. A prominent early clinical feature of retinitis pigmentosa is the loss of night vision as a result of death of rod photoreceptor cells. Proper expression of the wild-type rhodopsin gene is essential for the development and sustained function of photoreceptor cells. Mutations in the human rhodopsin that affect its folding, trafficking and activity are the most commonly encountered causes of retinal degeneration in afflicted patients. A single base-substitution at the codon position 23 in the human opsin gene (P23H) is the most common cause of ADRP in American patients. ADRP due to rhodopsin mutations has a wide range of clinical presentation and severity. Before 1991, phenotypic evidence pointed to different subsets of ADRP with varying prognoses. Molecular classification of ADRP and further sub-classification based on the region of the mutation in the rhodopsin gene allowed better prediction of a particular disease course. But even within these specific subsets, the prognosis is influenced by the specific mutation itself. Rhodopsin is a transmembrane protein (Rh1) that is the primary visual pigment (photopigment) of rod photoreceptors (which are the only cells in the retina to express rhodopsin and which express it as their most abundant protein) and forms an integral part of the visual cascade. It is a G-protein-coupled receptor activated by light that initiates the phototransduction cascade (visual transduction cascade taking place in photoreceptor rod outer segments.) converting light signals to electrophysiological signals in retinal neurons. This photo-activated signal transduction process is essential for vision. The structure and function of rhodopsin and the gene encoding it have been the subjects of intense scrutiny for many years because rhodopsin serves as a useful model for understanding the largest receptor family in the human genome, the G protein-coupled receptors, and because defects in the rhodopsin gene are the most common cause of the most common inherited blinding disease, retinitis pigmentosa. The human rhodopsin gene is the locus for numerous alleles linked to the neurodegenerative disease retinitis pigmentosa. Mutations in the rhodopsin gene account for 25% to 30% (30% to 40% according to ) of all cases of autosomal dominant retinitis pigmentosa (ADRP). Over 100 distinct mutations in the light-sensing molecule rhodopsin are known to cause (adRP). Most of these mutations are missense mutations affecting single amino acid residues in the rhodopsin protein. These mutations affect rhodopsin transport to the outer segments of rod photoreceptor cells, rhodopsin folding, and rhodopsin endocytosis. Mutations in the human rhodopsin that affect its folding, trafficking and activity are the most commonly encountered causes of retinal degeneration in patients afflicted with RP. A single base-substitution mutation of codon 23 of the rhodopsin gene in which proline is changed to histidine (Pro23His) in the human opsin gene accounts for the largest fraction of rhodopsin mutations observed in the United States and is the most common cause of ADRP in American patients. In 1990, the Pro23His mutation of the rhodopsin gene was reported as the first mutation associated with RP. This mutation has been described only in the United States, where it continues to be the most commonly described gene defect in RP. The phenotype of the RP associated with the P23H mutation is characteristically relatively mild but variable. Multiple studies have demonstrated that the degree of severity of a given mutation in the rhodopsin gene is based in large part on its position in the rhodopsin molecule—intradiscal, transmembrane, or cytoplasmic. Intradiscal mutations tend to be less severe, whereas mutations affecting cytoplasmic domains and retinol binding sites tend to be very severe. The severity of cytoplasmic mutations affecting maintenance of photoreceptor cell polarity, such as those at the C-terminus (sorting signal of rhodopsin) may result from inappropriate intracellular transport of the molecule. Some research has described transgenic mouse mutants that cause degeneration by prolonged activation of the phototransduction cascade. In this research null mutations in the rhodopsin kinase and arrestin genes, each of which plays a role in terminating rhodopsin activity, caused light-dependent retinal degeneration. A fraction of rhodopsin mutations alter the C-terminal tail of the protein, such as the point mutations P347L, P347S, P347R, and V345M.3–5 In addition, two frameshift mutations (fs 341del and fs 341-343del) are predicted to add additional residues to the C terminus, whereas Q344ter results in a C-terminal truncation, and an intron splice mutation (N88) is thought to remove the entire C-terminal tail of rhodopsin. Data indicate that expression of truncated rhodopsin negatively affects both photoreceptor function and health, compromising rod cell survival.The presence of truncated opsin may impair synaptic transmission or other cellular processes and eventually cause cell death. Large quantities of mislocalized opsin may decrease the availability of functional proteins in regions where truncated opsin is concentrated. The presence of truncated rhodopsin in the outer segments causes functional abnormalities and localization of rhodopsin in the outer and/or inner segments induces increased photoreceptor cell death. Like many other G protein-coupled receptors, the rhodopsin protein undergoes endocytosis following activation. Perturbation of endocytic regulation of rhodopsin has deleterious effects on photoreceptor cell physiology. In certain mutants, rhodopsin and its regulatory protein arrestin form stable complexes. As mentioned these complexes have a fatal effect; when taken up during endocytosis these complexes causes photoreceptor cell death, because the internalized rhodopsin is not degraded in the lysosome but instead accumulates in the late endosomes. The formation of toxic Rhodopsin- Arrestin complexes is also reported for mutants of human rhodopsin associated with severe forms of ADRP. For example, mutations at Arg135 are associated with severe forms of retinitis pigmentosa and exhibit a high affinity for arrestin, undergo endocytosis, and display endosomal abnormalities. Missense mutations in the opsin gene affecting the R135 and K296 residues of the protein product cause ADRP and result in accumulation of Rhodopsin-Arrestin complexes in the photoreceptor cell. The R135 mutant rhodopsin is noted to form stable complex with arrestin and undergo endocytosis resulting in aberrant endocytic vesicles in HEK cell culture system. Similarly, the K296E rhodopsin is observed to bind the visual arrestin with high affinity. This abnormal interaction is demonstrated to have pathological consequences in the retina. Besides this, the stable rhodopsin and arrestin complexes are shown to mislocalize and accumulate in the inner segments of rod photoreceptors of the mouse model of ADRP. Using mutants that are defective in late endosome to lysosome trafficking, it was shown that rhodopsin accumulates in endosomal compartments in these mutants and leads to light-dependent retinal degeneration. It was also shown that the internalized rhodopsin in dying photoreceptor cells were not degraded but instead showed characteristics of insoluble proteins. This data led to the implication of rhodopsin buildup in the late endosomal system as a novel trigger of death of photoreceptor neurons. Thus failure to degrade internalized rhodopsin in a timely manner triggers cell death of photoreceptor neurons, suggesting that lysosomal turnover of rhodopsin is vital in maintaining photoreceptor viability. The precise mechanisms regulating the pro-cell death signaling pathways and their interconnection with endocytosis is not well understood. It is speculated that a component innate to the endolysosomal system plays a crucial role in regulating the cell death signals emanating from the endosomes. This component senses the accumulation of rhodopsin and then engages the proper machinery to execute cell death in the retina. Failure of proper protein degradation and resultant subsequent accumulation of proteins, as in the case of rhodopsin-arrestin complexes, is a well-recognized cause of cell death in many neurodegenerative disorders, such as retinitis pigmentosa. Mutations non-retina-specific ADRP genes that encode for proteins essential for pre-mRNA splicing may be a major cause of ADRP. Proteins required for the formation of stable U4/U6 snRNPs and for assembly of the U4/U6.U5 tri-snRNP have been identified, including HPRP3, PRPC8, and PRPF31, proper function of these proteins is necessary for spliceosome performance. The rhodopsin transcript is a pre-mRNA splicing substrate affected by PRPF31 protein, meaning that rhodopsin (RHO) is among the target splicing substrate genes for PRPF31. Thus it can be understood that mutations in PRPF31 can cause alternative, potentially non-functional, forms of the rhodopsin protein. It was shown that expression of these mutant PRPF31 proteins significantly reduced rhodopsin expression in cultured retinal cells and induced apoptosis of retinal cells, establishing a link between mutations in proteins involved in pre-mRNA splicing and the expression of a critical retina-specific gene, rhodopsin. This shows that non-rhodopsin mutations may also be critical in presentation of retinal degenerative disorders. It suggests a mechanism for retinal degeneration caused by non-retinal-specific genes, such as PRPF31 mutations. ^ For example, a single peripherin/RDS splice site mutation was identified as the cause of retinopathy in eight families; the phenotype in these families ranged from retinitis pigmentosa to macular degeneration. ^ a b Sohocki, M. M.; Daiger, S. P.; Bowne, S. J.; Rodriquez, J. A.; Northrup, H; Heckenlively, J. R.; Birch, D. G.; Mintz-Hittner, H; Ruiz, R. S.; Lewis, R. A.; Saperstein, D. A.; Sullivan, L. S. (2001). "Prevalence of Mutations Causing Retinitis Pigmentosa and Other Inherited Retinopathies". Human Mutation. 17 (1): 42–51. doi:10.1002/1098-1004(2001)17:1<42::AID-HUMU5>3.0.CO;2-K. PMC 2585107. PMID 11139241. ^ a b c d Sullivan LS, Daiger SP; Daiger (1996). "Inherited retinal degeneration: exceptional genetic and clinical heterogeneity". Mol Med Today. 2 (9): 380–386. doi:10.1016/s1357-4310(96)10037-x. PMID 8885257. ^ a b c d e f g h i j k l m n Chinchore, Yashodhan; Mitra, Amitavo; Dolph, Patrick J. (2009). "Accumulation of Rhodopsin in Late Endosomes Triggers Photoreceptor Cell Degeneration". PLoS Genetics. 5 (2): e1000377. doi:10.1371/journal.pgen.1000377. PMC 2633617. PMID 19214218. ^ Sohocki, M. M.; Daiger, S. P.; Bowne, S. J.; Rodriquez, J. A.; Northrup, H; Heckenlively, J. R.; Birch, D. G.; Mintz-Hittner, H; Ruiz, R. S.; Lewis, R. A.; Saperstein, D. A.; Sullivan, L. S. (2001). "Prevalence of Mutations Causing Retinitis Pigmentosa and Other Inherited Retinopathies". Human Mutation. 17 (1): 42–51. doi:10.1002/1098-1004(2001)17:1<42::AID-HUMU5>3.0.CO;2-K. PMC 2585107. PMID 11139241. ^ a b c d e f Lee, E. S.; Flannery, J. G. (2007). "Transport of Truncated Rhodopsin and Its Effects on Rod Function and Degeneration". Investigative Ophthalmology & Visual Science. 48 (6): 2868–2876. doi:10.1167/iovs.06-0035. PMC 2570206. PMID 17525223. ^ a b c d Dryja TP; McGee TL; Hahn LB; et al. (1990). "Mutations within the rhodopsin gene in patients with autosomal dominant retinitis pigmentosa". N Engl J Med. 323 (19): 1302–1307. doi:10.1056/nejm199011083231903. PMID 2215617. ^ a b c d Dryja TP; Hahn LB; Cowley GS; McGee TL; Berson EL (1991). "Mutation spectrum of the rhodopsin gene among patients with autosomal dominant retinitis pigmentosa". Proc Natl Acad Sci U S A. 88 (20): 9370–9374. Bibcode:1991PNAS...88.9370D. doi:10.1073/pnas.88.20.9370. PMC 52716. PMID 1833777. ^ a b c Dryja TP (1992). "Doyne Lecture: rhodopsin and autosomal dominant retinitis pigmentosa". Eye. 6: 1–10. doi:10.1038/eye.1992.2. PMID 1358680. ^ a b c d e f g h i j k Yuan, L; Kawada, M; Havlioglu, N; Tang, H; Wu, J. Y. (2005). "Mutations in PRPF31 Inhibit Pre-mRNA Splicing of Rhodopsin Gene and Cause Apoptosis of Retinal Cells". Journal of Neuroscience. 25 (3): 748–757. doi:10.1523/JNEUROSCI.2399-04.2005. PMC 2149905. PMID 15659613. ^ a b Dejneka NS, Bennett J (2001). "Gene therapy and retinitis pigmentosa: advances and future challenges". BioEssays. 23 (7): 662–668. doi:10.1002/bies.1092. PMID 11462220. ^ Dryja, T. P.; McEvoy, J. A.; McGee, T. L.; Berson, E. L. (Sep 2000). "Novel rhodopsin mutations Gly114Val and Gln184Pro in dominant retinitis pigmentosa". Invest Ophthalmol Vis Sci. 41 (10): 3124–7. PMID 10967073. ^ Brill, E; Malanson, K. M.; Radu, R. A.; Boukharov, N. V.; Wang, Z; Chung, H. Y.; Lloyd, M. B.; Bok, D; Travis, G. H.; Obin, M; Lem, J (2007). "A Novel Form of Transducin-Dependent Retinal Degeneration: Accelerated Retinal Degeneration in the Absence of Rod Transducin". Investigative Ophthalmology & Visual Science. 48 (12): 5445–5453. doi:10.1167/iovs.06-1402. PMC 2248236. PMID 18055791. ^ a b Brill, E; Malanson, K. M.; Radu, R. A.; Boukharov, N. V.; Wang, Z; Chung, H. Y.; Lloyd, M. B.; Bok, D; Travis, G. H.; Obin, M; Lem, J (2007). "A Novel Form of Transducin-Dependent Retinal Degeneration: Accelerated Retinal Degeneration in the Absence of Rod Transducin". Investigative Ophthalmology & Visual Science. 48 (12): 5445–5453. doi:10.1167/iovs.06-1402. PMC 2248236. PMID 18055791. ^ Chang GQ, Hao Y, Wong F (1993). "Apoptosis: final common pathway of photoreceptor death in rd, rds, and rhodopsin mutant mice". 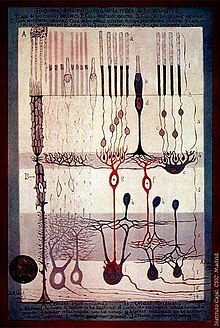 Neuron. 11 (4): 595–605. doi:10.1016/0896-6273(93)90072-y. PMID 8398150. ^ a b Dryja TP; McGee TL; Reichel E; Hahn LB; Cowley GS; et al. (1990). "A point mutation of the rhodopsin gene in one form of retinitis pigmentosa". Nature. 343 (6256): 364–366. Bibcode:1990Natur.343..364D. doi:10.1038/343364a0. PMID 2137202. ^ a b c Pannarale MR; Grammatico B; Iannaccone A; et al. (1996). "Autosomal dominant retinitis pigmentosa associated with an Arg-135-Trp point mutation of the rhodopsin gene: clinical features and longitudinal observations". Ophthalmology. 103 (9): 1443–1452. doi:10.1016/s0161-6420(96)30485-5. PMID 8841304. ^ a b Sung C-H; Davenport CM; Hennessey JC; et al. (1991). "Rhodopsin mutations in autosomal dominant retinitis pigmentosa". Proc Natl Acad Sci U S A. 88 (15): 6481–6485. Bibcode:1991PNAS...88.6481S. doi:10.1073/pnas.88.15.6481. PMC 52109. PMID 1862076. ^ Rivolta, C., Sharon, D., DeAngelis, M. M. & Dryja, T. P. (2002) Hum. Mol. Genet. 11, 1219–1227. ^ Menon, S. T., Han, M. & Sakmar, T. P. (2001) Physiol. Rev. 81, 1659–1688. ^ a b c Dryja TP, McGee TL, Reichel E, Hahn LB, Cowley GS, Yandell DW, Sandberg MA, Berson EL, et al. (1990). "A point mutation of the rhodopsin gene in one form of retinitis pigmentosa". Nature. 343 (6256): 364–366. Bibcode:1990Natur.343..364D. doi:10.1038/343364a0. PMID 2137202. ^ a b Berson EL (1990). "Ocular findings in a form of retinitis pigmentosa with rhodopsin gene defect". Trans Am Ophthalmol Soc. 88: 355–388. PMC 1298597. PMID 2095030. ^ a b Berson EL, Rosner B, Sandberg MA, Dryja TP (1991). "Ocular findings in patients with autosomal dominant retinitis pigmentosa and a rhodopsin gene defect (Pro-23-His)". Arch Ophthalmol. 109 (1): 92–101. doi:10.1001/archopht.1991.01080010094039. PMID 1987956. ^ Heckenlively JR, Rodriguez JA, Daiger SP (1991). "Autosomal dominant sectoral retinitis pigmentosa: two families with transversion mutation in codon 23 of rhodopsin". Arch Ophthalmol. 109 (1): 84–91. doi:10.1001/archopht.1991.01080010086038. PMID 1987955. ^ Weleber RG, Murphey WH, Rodriguez JA, Lovrien EW, Litt M, Daiger SP (1991). "Phenotypic expression of Pro-23-His mutation of rhodopsin in a large family with autosomal dominant retinitis pigmentosa [abstract]". Invest Ophthalmol Vis Sci. 32: 913. ^ Sung C-H, Schneider BG, Agarwal N, Papermaster DS, Nathans J. Functional heterogeneity of mutant rhodopsins responsible for autosomal dominant retinitis pigmentosa" Proc Natl Acad Sci U S A 1991;88:8840–8844. ^ Fishman GA, Vandenburgh K, Stone EM, Gilbert LD, Alexander KR, Sheffield VC (1992). "Ocular findings associated with rhodopsin gene codon 267 and 190 mutations in autosomal dominant retinitis pigmentosa". Arch Ophthalmol. 110 (11): 1582–1588. doi:10.1001/archopht.1992.01080230082026. PMID 1444916. ^ a b Sandberg MA, Weigel-DiFranco C, Dryja TP, Berson EL (1995). "Clinical expression correlates with location of rhodopsin mutation in dominant retinitis pigmentosa". Invest Ophthalmol Vis Sci. 36 (9): 1934–1942. PMID 7635666. ^ Berson EL, Rosner B, Sandberg MA, Weigel-DiFranco C, Dryja TP (1991). "Ocular findings in patients with autosomal dominant retinitis pigmentosa and rhodopsin, proline-347-leucine". Am J Ophthalmol. 111 (5): 614–623. doi:10.1016/s0002-9394(14)73708-0. PMID 2021172. ^ Lem J, Fain GL (2004). "Constitutive opsin signaling: night blindness or retinal degeneration?". Trends Mol Med. 10 (4): 150–157. doi:10.1016/j.molmed.2004.02.009. PMID 15059605. ^ Chen CK, Burns ME, Spencer M, et al. (1999). "Abnormal photoresponses and light-induced apoptosis in rods lacking rhodopsin kinase". Proc Natl Acad Sci USA. 96 (7): 3718–3722. Bibcode:1999PNAS...96.3718C. doi:10.1073/pnas.96.7.3718. PMC 22360. PMID 10097103. ^ Xu J, Dodd RL, Makino CL, Simon MI, Baylor DA, Chen J (1997). "Prolonged photoresponses in transgenic mouse rods lacking arrestin". Nature. 389 (6650): 505–509. Bibcode:1997Natur.389..505X. doi:10.1038/39068. PMID 9333241. ^ Horn M; Humphries P; Kunisch M; et al. (1992). "Deletions in exon 5 of the human rhodopsin gene causing a shift in the reading frame and autosomal dominant retinitis pigmentosa". Hum Genet. 90 (3): 255–257. doi:10.1007/bf00220073. PMID 1487240. ^ a b Lee, E. S.; Flannery, J. G. (2007). "Transport of Truncated Rhodopsin and Its Effects on Rod Function and Degeneration". Investigative Ophthalmology & Visual Science. 48 (6): 2868–2876. doi:10.1167/iovs.06-0035. PMC 2570206. PMID 17525223. ^ Jacobson SG, Kemp CM, Cideciyan AV, Macke JP, Sung CH, Nathans J (1994). "Phenotypes of stop codon and splice site rhodopsin mutations causing retinitis pigmentosa". Invest Ophthalmol Vis Sci. 35 (5): 2521–2534. PMID 8163341. ^ Sung CH; Schneider BG; Agarwal N; et al. (1991). "Functional heterogeneity of mutant rhodopsins responsible for autosomal dominant retinitis pigmentosa". Proc Natl Acad Sci USA. 88 (19): 8840–8844. Bibcode:1991PNAS...88.8840S. doi:10.1073/pnas.88.19.8840. PMC 52606. PMID 1924344. ^ Orem NR, Dolph PJ; Dolph (2002). "Epitope masking of rhabdomeric rhodopsin during endocytosis-induced retinal degeneration". Mol Vis. 8: 455–461. PMID 12486400. ^ Satoh AK, Ready DF; Ready (2005). "Arrestin1 mediates light-dependent rhodopsin endocytosis and cell survival". Curr Biol. 15 (19): 1722–1733. doi:10.1016/j.cub.2005.08.064. PMID 16213818. ^ a b Chen J; Shi G; Concepcion FA; Xie G; Oprian D; et al. (2006). "Stable rhodopsin/arrestin complex leads to retinal degeneration in a transgenic mouse model of autosomal dominant retinitis pigmentosa". J Neurosci. 26 (46): 11929–11937. doi:10.1523/jneurosci.3212-06.2006. PMID 17108167. This page was last edited on 16 March 2019, at 22:02 (UTC).